I'm sure you've heard the news about Senator Antonio Trillanes signing twelve waivers addressed to AMLC and the Ombudsman to show his innocence and that he has nothing to hide. But that is a lie and just a PR stunt. Ridiculous, right? You want more reasons to laugh at Trillanes? During his presscon about the said bank accounts, he very clearly said that there is no bank named Nova Scotia in Canada. He has a document where he marked Nova Scotia as non-existent. No doubt, to make sure he can claim that the news about his bank account are "Fake News." Facebook page Angat Pilipino posted a video wherein they compiled Tulfo saying Trillanes has a bank account in Nova Scotia, the clip of Trillanes saying it was non-existent, and finally a clip of a reporter proving that there is a Nova Scatia bank. Tulfo: "Meron din po siya sa Nova Scotia. Itong Nova Scotia po, ito po ay sa Canada." Trillanes: "Yung sinasabi niya, ito, ito yun, ano? Yung Nova Scotia bank na tinatawag, alam niyo po ba na walang ganyang banko?" Reporter from foreign news clip: "The Bank of Nova Scotia is one of North America's premier financial institution and Canada's most international bank. The Globe and Mail ranks the Bank of Nova Scotia as the third largest company in Canada with a capitalization in excess of $55 Billion." 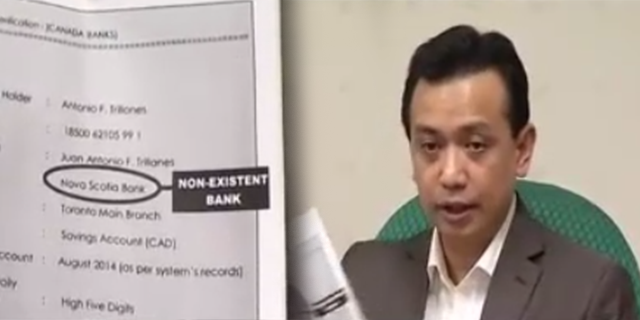 Trillanes: "So, ganyan lang kasimple, napakita natin na ito ay mga bogus." Oops, major fail. So, who's the bogus now, Trillanes?